The first thing I saw when I opened the package, was the spools and the loom. I didn't have a clue what they were and what I was supposed to do with it. For a full day and through the night I panicked. How am I supposed to blog about this strange stuff? How am I going to make anything worth blogging about? I was starting to wonder what I'd gotten myself into. The next day I dug into it. And guess what? It's really not hard at all. In fact, my 11 year old daughter even made a braided bracelet for her friend. Once I got going, it was kind of addicting. Every Friday for the next three weeks, I'll be showing you how I made the different bracelets. So be sure to check back for the tutorials. The first bracelet I tried was a solid beaded bracelet. One thing I learned: Don't braid too long at the beginning before you add the beads or at the end. In fact, I'm still working on that, but I'm getting better. The next bracelet I tried was this blue bracelet speckled with gold beads. I did end up buying some bronze findings. I'm one of those people who don't like to mix my metals. I couldn't bring myself to use a silver clasp with the gold beads. This was really easy to create this look. It's all in how you string the beads on. I'll be sharing exactly how I created this look soon. The next bracelet I made started out as an accident and ended up being my favorite of the bunch. I wanted to make a tutorial of how to do Kumihimo and so I grabbed different colored embroidery thread so it would be easier to demonstrate through pictures. I ended up loving how it looked and started playing around with adding beads only some of the time. I'm so excited about how it turned out. I entered a beaded bracelet using this method into my county fair and got a blue ribbon! A tutorial is in the works for this bracelet as well. 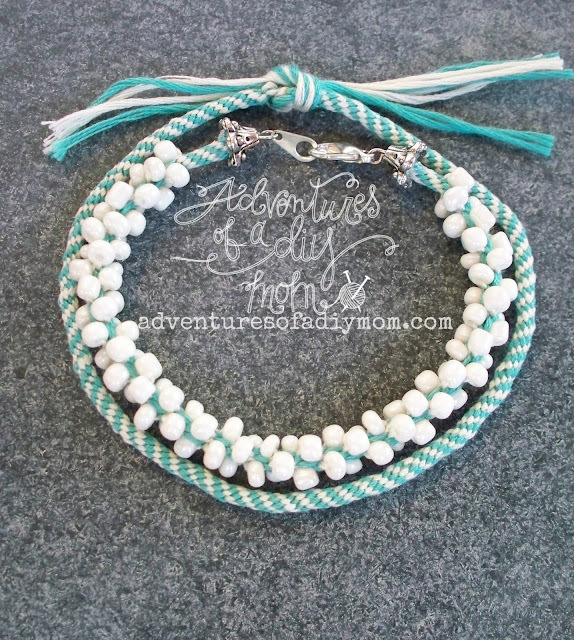 I also made a braided anklet with the same colors of thread. The last bracelet I made was this spiral bracelet, with the blue and gold beads. Another easy method that I'll be sharing soon. Sept 6 - Embroidery Thread and Seed Bead Bracelets. Whipperberry , Adorned From Above, Housewife How To's, Huckleberry Love, All Things With Purpose, Home Coming, Clean & Scentsible, and at these parties. You did a magnificent job! All are gorgeous! I can't believe how beautiful they are! You are great! Pat. Beautiful job! 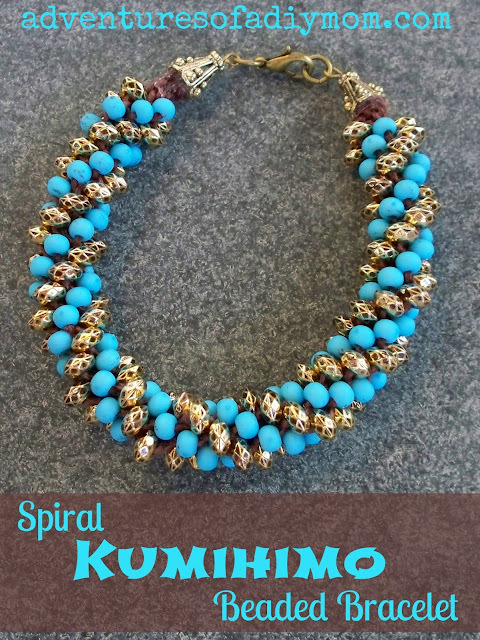 I love those shimmery beads with the turquoise in the spiral. Can you tell me what the color name is for them? 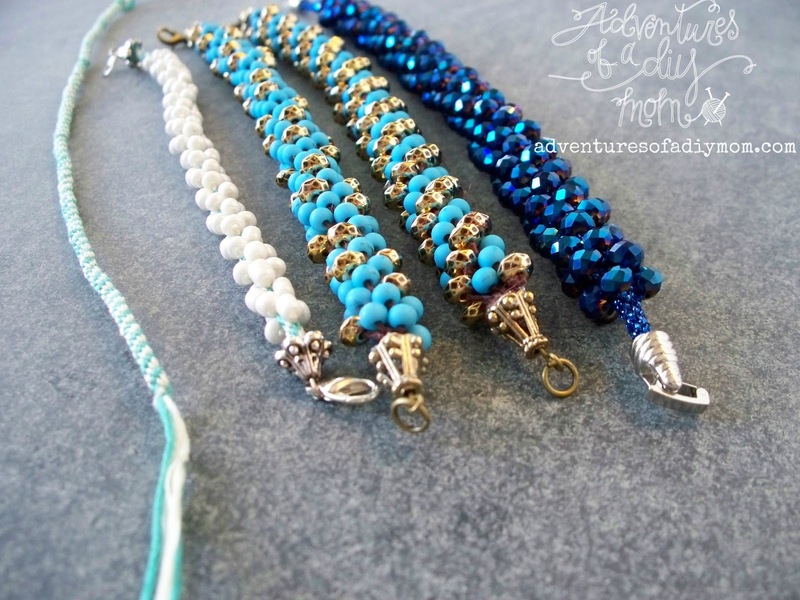 ohhh i love the spiral one with the blue and gold beads. i've been a little intimadated to dig into my supplies!!! These are all so beautiful! I would love to be able to make them. Thank you for sharing on Thursday's Treasures. 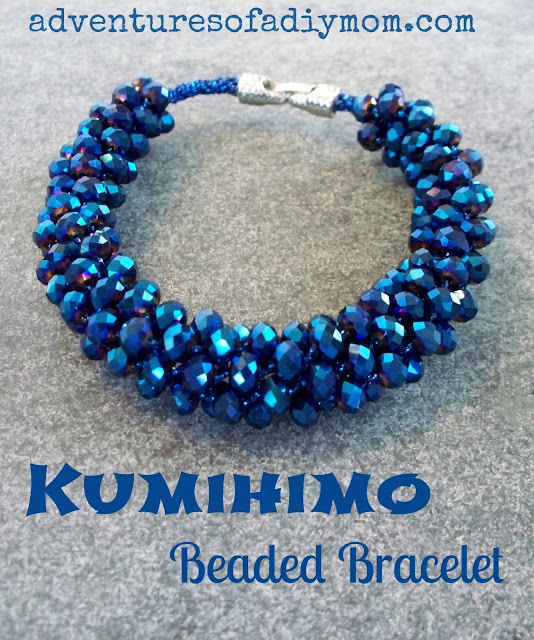 I am featuring these gorgeous bracelets on Week 101. 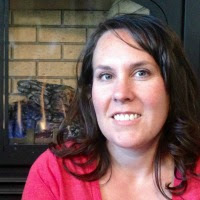 Please stop by and grab my "I was featured on" button. How many beads did you end up using? For the sparkly and blue and gold bracelets, I started out with 20 on each strand, but then added a some more. My guess would be somewhere between 180 and 200 total. For the white bracelet with the seed beads, I used 26 beads on 4 of the strands so a total of 104.
what is the price of Beautiful Bracelets?